Milwaukee Road, Kent Auto Marshalling Area, Kent Washington, August 17, 1970. One of the many enjoyable results of being a ferroequinologist – student of the Iron Horse – is discovering the amazing variety of locomotives, maintenance of way equipment and rolling stock. If any part of railroading remains chock full of innovation, rolling stock, in my estimation, sits on top of the list! Finding methods for transporting everything from cows to nuclear waste, ad infinitum. 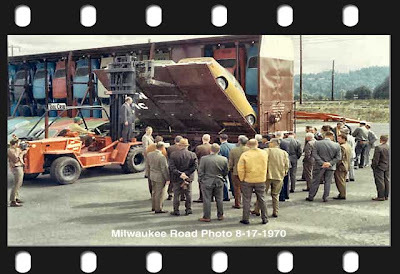 Most of us are familiar with the twin and triple deck auto carriers which were really neat to watch as they passed by, seeing if you could identify the vehicles being transported. Of course, that preordained that motor vehicles had a distinct style, as opposed to the look-alike “Nike shoe” cars manufactured in modern history! 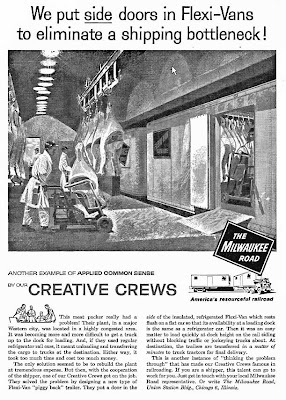 Working in conjunction with General Motors, the Milwaukee Road created the “Vert-A-Pak” rail car, designed for transporting up to 30 compact motor vehicles. I mean when you stop and think about this radical design, it is simply amazing to imagine what thought processes were at work, perhaps beginning with pencil doodling on a yellow pad! Looking carefully at these photos, apparently this was a “press party” arranged to inaugurate this service to Puget Sound. Of course, seeing vehicles stood on their noses brings up a slew of interesting and logical questions, mostly concerning fluids in the motor and battery. Perhaps a scholar of this rail car can add a comment or two addressing those issues. 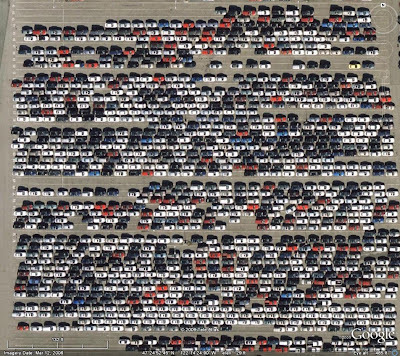 The sprawling Kent Auto Marshalling complex, build in partnership with the Union Pacific, opened in late 1969 and was an absolute wonder to behold. I do not know what the capacity was, but it was big and colorful! As our civilization became more law abiding, the need to carry automobiles inside a protective shell became obligatory. This reminds me of a conversation I had with my Audio Visual Producer counterpart at Southern Pacific down on Market Street, when I was at Freightliner. He related a story about a derailment out in the middle of no-where, which included a cut of tri-level auto carriers. Despite the fact that many of the cars were not damaged, some slightly scratched, bulldozers were dispatched to bury the entire consignment, to avoid possible future litigation should someone discover their car had been in a train derailment! 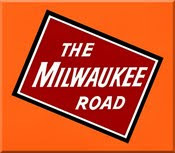 The Vert-A-Pac (not Vert-A-Pak nor Vert-A-Pack) cars were designed by Southern Pacific and GM, not Milwaukee. The prototype (which was never used in service) was built by SP's Sacramento General Shops. 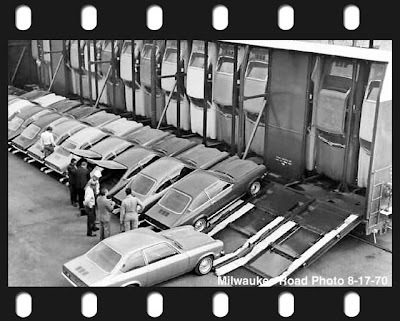 Milwaukee did have 12 of the first lot of Vert-A-Pacs (183 cars, of which SP owned 119) and a few from the second and third lots as well. Milwaukee's Vert-A-Pacs were on TTVX flats. >> Of course, seeing vehicles stood on their noses brings up a slew of interesting and logical questions, mostly concerning fluids in the motor and battery. The Vert-A-Pac car was only used to transport the Chevy Vega cars, which were specially designed to withstand the nose-down transport in full running condition. The cars were hanging on the railroad car doors by four cast iron hooks attached to the chassis.